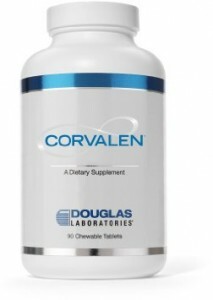 Douglas Labs Corvalen® Ribose Chewable Tablets are a quick and convenient way of providing D-Ribose sugar in your diet. These tablets are sweetened with xylitol and have a natural orange/vanilla flavoring. D-ribose is a natural sugar that may support circulatory health‚ energy production‚ and mitochondrial function. The human body can utilize D-Ribose as a form of metabolic fuel. It is a carbohydrate that plays a role in the production of adenosine triphosphate (ATP). ATP is a direct source of energy for cells, and levels need to be maintained for healthy functioning. • Is clinically proven to replenish core energy and accelerate natural energy production to meet the substantial energy requirements of the heart, muscles, and cells. • Facilitates rapid energy restoration to improve cardiac function and reduce muscle soreness, stiffness, and fatigue. • Performs like no other compound to regulate the energy synthesis pathways that may restrict the body’s natural ability to produce D-Ribose during times of metabolic stress. Corvalen granular powder can be dissolved in 2 oz. or more of juice or milk, or sprinkled over your food of choice. Do not mix with carbonated beverages. The usual dose is a 5-g (1 scoop) serving twice daily with meals. A third serving may be added with a mid-day meal as needed. Alternative dose: one scoop just before and after exercise or physical activity. This product contains NO salt, yeast, wheat, gluten, corn, dairy products, artificial flavoring or colors, preservatives, or ingredients of animal origin. Patients with insulin-dependent diabetes and pregnant women should consult their healthcare professional before use. A single-dose measuring scoop is provided in each 280 g jar. Store in a cool, dry place, away from direct light. Avoid excessive heat and moisture.